Pancakes, eggs, hash browns, and sausages all cooking in the same pan sounds like breakfast heaven, doesn’t it? With the MasterPan, you can cook five different foods simultaneously over a single burner, saving you money and cleanup time. This sectioned frying pan is coated with durable, PFOA-free nonstick so you can wash it or even just wipe it clean. Use the divided sections to please picky eaters or those with mild food allergies. Even though this oversized pan extends beyond the burner, the entire surface heats up. But the center is great for grilling meats and seafood since it gets 15% to 20% hotter than the sides. Use the side compartments for—appropriately—veggies, pasta, or other side dishes. The MasterPan is safe in the dishwasher and the oven, with a heat-resistant handle up to 350°F. Great for tiny kitchens, camping, or cooking for one, the MasterPan is also a master at reheating leftovers. Cut down on cooking costs and cleanup with a single, one-size-cooks-all MasterPan. Hi everyone! I'm proud to present the MasterPan to The Grommet. I'm happy to answer any questions you have! Some of us were just looking for this a couple of weeks ago! I think I love you. Hey Alicia, thank you so much for the kind words. We love you to ! I went camping last weekend and could have really used this for making breakfast for the family! LOVE IT but I wish that it was made in the USA. 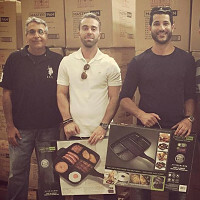 @S That would have definitely been the cherry on top, but we can assure you that the MasterPan has cut no corners when it comes to quality and safety. Please note we Import our coating to guarantee the highest quality from USA. Our coating is called Whitfords Xylan® plus. More detailed information can be obtained from the manufacturers website. @David what country are you located in if you are IMPORTING from the USA? That would be lovely Canada, Dee! A read this on an online review: The description on this item is dangerously misleading. The product is listed as "No PFOA's", but it is coated in "PTFE", which is the chemical abbreviation for Teflon (this product uses a generic brand version of it, called Xylan) - which, when heated improperly, breaks down into several very dangerous compounds, one of which is PFOA. When cooking with a pan like this, if any of the sections are *not* filled during cooking, it would be very easy to exceed the safe-heat-temperature of PTFE/Teflon and cause Teflon outgassing. Obviously the manufacturer is not responsible for the end-user improperly using the cookware, but it is disingenuous to obscure the nature of this product with buzzwords when it is a product that is *more likely* to be improperly used and create a problem for the consumer. I currently work with the Masterpan organization and we would like to mention that the statements by JR are false. Please see below for the proper information regarding the pan. This coating complies with all current FDA regulation part 21 CFR 175.3 clause C3 for USA and BS-EN 12398-1 regulation for Europe for coating intended for regular use with food. We have in addition carried out further compliance test using Intertek a world standard agency for further FDA matters SGS for Torque Test and a Thickness accuracy test. All certificates are available to view on request. We object to the fact that you are comparing Teflon to Whitford as both are brands and Whitford a well known USA firm is not a generic fake copy of Teflon. We hope the above reassures our customers that we take great pride in our product and have cut no corners with our Globally Patented Masterpan and all our staff with children use Masterpan at their homes as we are confident in its safety, unlike the cheap far east non-stick unbranded products in the market nowadays where your below comments maybe valid. Can the pan be used on any type of stove? @Mary Jo Almost, it can be used on Gas or electric stoves. It cannot, however, be used on induction stove tops. Hi, David. What kind of material is the pan made from? Will it work on an induction cooktop? Thanks. It looks like a great idea! Is there a video which show the pancakes, eggs, and the other smaller segments being used? I like the concept, but flipping and egg or pancakes looks like it would be difficult. I can certainly understand your skepticism, although we do not have a video of the eggs or pancakes actually being flipped, since it seems to be a concern of not just you but other potential customers as well we will certainly have one made. I can reassure you that because of the high quality non-stick coating we use, it is extremely easy to flip any flat surfaced food item on the pan, you can use a spatula a fork or any utensil you feel comfortable with. 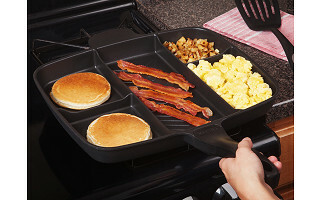 Great idea and was going to buy a pan but then when I saw it isn't made in the USA, changed my mind. Don't like the fact that you'll make money from Americans while not helping to pay American salaries. Shame on you and the Grommet for allowing this to happen. @Louise well said BUY AMERICAN and save our jobs. Everyone on this thread, we understand buying made in the US products is important to consumers, we don't want you compromising your shopping values and we encourage you to shop our made in the USA values page. However, made in the US is but one of the many different values we support in discovering products. I certainly don't think any shame should come into play over an innovative product like MasterPan. There are Makers all over the world that we work with and MasterPan is one of them. It looks FABULOUS! I'm clicking buy as soon as I click submit on my comment. I'll check back later to report on how well it works! Glad to hear it, Cathy! Bon appetit! I can't help but wonder how useful this product is. The compartments are small, and the food looks posed. I can't believe that someone actually scrambled the eggs and fried the potatoes. There no room to spread the food out or to keep rotating them. How do you brown potatoes when only a few reach the cooking surface? If I tried to turn them with a spatula, they would be all over the stove. To be honest, I think it I bought this, it would sit in the drawer. @DianneIt might work for reheating, but certainly not for simultanously cooking the foods shown, which all have different heat requirements. Kinda silly. @dee @dianne I was one of the employees to test this item. The potatoes I cooked separately because they need to be cooked on such a high heat but the eggs, pancakes, and bacon, since they can be cooked a similar heat, I did cook all in the same pan. The left over potatoes ended up in this while we did dishes to stay warm in case anyone wanted seconds. I *HATE* mushrooms and my boyfriend loves them in his eggs so this has been perfect so we don't dirty up three to four pans when we make breakfast. It's also significantly helped us with portion control. We used to always over eat at breakfast. This keeps our meal size in check which we very much appreciate. Another awesome use is for tacos and all the cooked toppings. All one pan. Major score for the dish washer of the night. There's a perfect spatula on this site, search for Git It Right. It's the only style I use in general but it's perfect for this. Based upon your test... The "MasterPan" is best for reheating. I can see that based upon the segment sizes. It would be nice if the $80 pan was marketed that way! compartments are way small unless cooking for one maybe. Eggs bacon and pancakes don't cook at the same heat unless you want overdone eggs. You don't throw every item in at the same time, Foods cook differently so its best to time when to cook your foods. For example your eggs will cook faster then you potatoes, so you will put the potatoes in 1st and let them cook for a while before putting your eggs in. Hi Lynne, thanks for the comment. You could turn it on its side and use two of the side burners to keep it out of your way! Hi there. Will it work on an induction cooktop? @Melissa No, it will work on any electric or gas cook top, however. I have this pan and really like it. Would it be possible to get a glass top cover to this pan in the future? Yes, we are currently working on glass top cover to complete the full set. I usually love the new ideas here - but this one missed the mark...the sections are way too small - how can you flip a pancake in that small section? Maybe this will work for some - but I don't see it for me...and the price? YIKES!! Hi Dee, check in on Arnold's comments below. He had similar concerns as you do and found the MasterPan worked better than he expected. The price is a reflection of an innovative product made of high-quality materials. Anyone that actually cooks would know this is ridiculous. Sorry. Hi Robert, I too cook and though I have never used this pan I can envision many ways to use it. I hate to do dishes my self and this would allow me to prepare a dish for one without dirtying 4 pans. This is great for singles. Those of you who say it is too small for more than one well you have someone to cleanup after you cook! ???? That's what I'm saying, Veronica! Golf and washing dishes, the lower the better! Enjoy! can pan be weed on induction cook top? How does it do on camp fire ? Hi Nancy, thanks for the questions. It cannot be used on an induction cooktop and probably not a campfire either. looks pretty cool ,as being single this might help, and keep the portions under control, I have a small spatula that would probably fix well keep coming up with ideas I have bought many things. This pan will definitely help you keep your portions under control. It will also help you become more creative with your dishes. 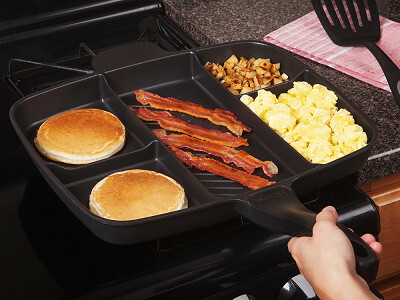 What an amazing idea, I have been looking for a pan like this for so long. This pan will work wonders for me and my girlfriend. Can anyone say TAPAS ! We are glad to hear that. Yes, TAPAS is an amazing idea on the Masterpan. You can have 5 -6 different items cooking at the same time on 1 pan. I am happy to see this pan on The Grommet, I have already purchased this pan so I will not buy it again. However for those who are skeptical about the size of the compartments like I was, you will be surprised on how perfect the compartment sizes really are. It is probably the best pan to cook a meal for 2 people, and it fits perfectly on my stove. I have created several different dishes with the Masterpan so far and they all came out perfectly. Oh and washing the pan was a breeze, the non-stick coating really made everything so much easier. As a customer that has already used the MasterPan, we really appreciate your feedback. We would love to see some pictures of dishes you have created. please feel free to send some over to our website. We also appreciate the feedback on the actual size of the compartments. It is sometimes difficult to see how efficient this pan really is from a picture, however once you actually use the pan you quickly notice that a lot of work has been put in to perfecting this product. Hello David, We are currently working on finalizing the induction friendly Masterpan, but as of now this version does not work on induction stoves. Purchased it on masterpan's site, got it a few weeks ago, works great, very practical!! Are you going to make a cover for the pan? If you are, I think I'll wait to buy it then, because $79.95 is a lot just for a pan. It seems to be a very popular inquiry, we are currently working on having a glass cover. you will enjoy the endless combination of dishes you will be able to create with just 1 pan. Hi David. This looks like a great idea. I was wondering though if you only need to use 4 of the sections can I leave the unused section empty or do I need to put something in it like water? The pan is not coated with Teflon (see the Maker's comment response to Ramon above) so using it with an empty section should be completely fine! Because the heat is distributed evenly, the sections that you are not using can be left alone. You do not need to put any water in the empty sections. I don't understand having a pan that just works for heating food up for one or two persons or cooking a meal that is almost limited to just meals like breakfast and Tapas. Perhaps other functions can be found but if none come to mind quickly for me, I don't see the need. I find that the concept is valid but the long term functionality of a limited use tool in the kitchen is a waste of space and money. I think this would be most suited for situations where there is only one burner/heat source such as camping. Not enough going for it for me. Sandy, you can't see this right now, but I'm giving you a standing ovation. Thank you very much, I hope you enjoy! It sure is helpful, Sandy! Thanks again! So are we, LaShauna! Let the masses know to get it at The Grommet! Pancakes, eggs, hash browns, and sausages all cooking in the same pan sounds like breakfast heaven, doesn’t it? With the MasterPan, you can cook five different foods simultaneously over a single burner, saving you money and cleanup time. This sectioned frying pan is coated with durable, PFOA-free nonstick so you can wash it or even just wipe it clean. Use the divided sections to please picky eaters or those with mild food allergies. Even though this oversized pan extends beyond the burner, the entire surface heats up. But the center is great for grilling meats and seafood since it gets 15% to 20% hotter than the sides. Use the side compartments for—appropriately—veggies, pasta, or other side dishes. The MasterPan is safe in the dishwasher and the oven, with a heat-resistant handle up to 350°F. Great for tiny kitchens, camping, or cooking for one, the MasterPan is also a master at reheating leftovers.